Declined as already addressed in ZetaTalk. Thank you Gerard for the links!!! The cover-up is still alive and well, as NASA shows. How does this type of article with the statement from NASA fit into the prong strategy? Hi ,can Zeta give an insight about this interesting news/event: US Marines Storm the CIA Headquarters in Langley,Virginia, named “The George Bush Center for Intelligence” Witness report: “US Marine Expeditionary Unit (MEU) Lands at Langley (about 2200 Marines). A large contingent of Marines arrived at CIA Headquarters in tilt-rotor aircraft and when the Marines deplaned, they were armed and moved quickly into CIA Headquarters! Never before has anything like this ever been seen taking place at CIA Headquarters. We know that CIA have rogue units that they do not fallow with existing White House policy, like Chemical attack in Syria from April 2017 show this. Is this unit part of Bush/Cliton/ cabal influence that basically undermine the current leadership ? The article mention a theory that President of the United States is moving to take out rogue elements in the Intelligence Community, at the request of his new CIA Director. It is rumored that these rogue elements have been undermining the Administration since before it took office last January, and may be connected to some well publicized "incidents" which suddenly resumed taking place this year, (mass shootings / violent protests) after a brief respite once the Obama Administration left office. Hi ,can Zeta give an insight about this interesting news/event? We can call this a CIA purge? Is any chance that top Politicians arrest begins officially? Reports are beginning to surface that a Marine Expeditionary Unit (MEU) landed at Langley. According to persons who reside near Langley, a large contingent of Marines arrived at CIA Headquarters in tilt-rotor aircraft and when the Marines deplaned, they were armed and moved quickly into CIA Headquarters! Those witnesses also say that a significant number of tilt-rotor aircraft can be clearly seen on the grounds of CIA Headquarters, parked on the grass around the building. Conspiracy Theorists are claiming the President of the United States is moving to take out rogue elements in the Intelligence Community, at the request of his new CIA Director. The number of sealed indictment presently on US District Court Dockets across the United States has reached an astonishing 1800 as of Friday, November 17. These Sealed Indictments began appearing on US District Court Dockets on October 31. The CIA Headquarters building is located at 1000 Colonial Farm Road in McLean, Virginia, and can be reached via George Washington Memorial Parkway. However, due to a need for secrecy, the complex may only be accessed by those with authorization (e.g., appropriate credentials) or by appointment; only authorized vehicles may access the private road leading to the complex from George Washington Memorial Parkway. 4 ch/\N reporting that many ospreys were seen on ground around Langley. Multiple tweets from peeps in are with photos of flying osprey but no shots of ospreys on Langley grounds. Pentagon sources confirm multiple Internet reports that Marines stormed the CIA headquarters this past weekend. One of the aims was to shut down Operation Mockingbird, the CIA group that turned the mass media, as well as Google, Facebook, etc. into mass mind-control propaganda, say NSA sources. The institutional heirs to the group that murdered President John F. Kennedy are also being rounded up, according to Pentagon sources. The Department of Justice and Special Counsel Robert Mueller are working overtime and may exceed 2000 sealed indictments. in 2015, removing any control by Jewish Bankers, this was likewise secret, but we could see that this happened because the .org website disappeared, leaving only the .gov. General Dunford is using the DOD prosecution at present using national security threats as the rationale. For lack of a better term to use with civilians, Hillary is being court martialed, for her time as Secretary of State which is an official position equivalent to a military officer, and as he, General Dunford, is now in charge, all federal positions can be seen as military positions. Orthodox Patriarch warns of approaching end times, asks not to push for revolutionary change. Could the Zetas say something about this? The Book of Revelation is the final book of the New Testament, written by John of Patmos. Where the Patriarch Kirill described the current times as those depicted in the Book of Revelations, he was also chiding politicians. Without citing Nibiru directly, he noted something that could be “seen with the naked eye” and an “approach”. What is it that politicians and others are doing to march mankind “towards the abyss”? They are insisting on the status quo, and pretending that the Earth changes are not going to destroy their current comfortable life. Floods and devastating earthquakes, bankrupt corporations and the banking system defaulting – all this awaits. in these admissions about Nibiru, and yes, this is the start. Russia has always been more open about the alien presence and the pending passage of Nibiru, while stopping short of admitting publically or officially that Nibiru exists. What has happened that Russia is now taking a bolder stance? On February 4 a Russian astronomer stated that a bolide was from the trash in the tail of Nibiru. The cover-up over the presence of Nibiru is in its death throes. There is the increased visibility, where the Second Sun is making an appearance and being filmed, setting the Internet abuzz. There is the Earth wobble, what the “Main Meteorological Organization” in Russia is calling an axis tilt, so that the Sun rises and sets where it ought not on a daily basis. Is this just a scientific study of known data, or is this another part of the announcement-of-sorts. The article mentions possible increase in earthquakes starting next year, and a hint of rotation slowdown. Will Zetas comment? Is the establishment expecting the 7 out of 10 events to unfold in 2018? Can the Zetas comment on this article? This article mentions a pole shift and the Earth wobble. I noticed a pattern. They don’t cite ZetaTalk, but concepts such as polar shift, axis tilt, and Earth wobble are being mentioned more often! Due to slowing rotation? A tiny slowdown in Earth's rotation next year could trigger more earthquakes than usual. Past periods of slow rotation over the last 100 years have coincided with more earthquakes than average, according to research presented last month at the annual meeting of the Geological Society of America. The basic idea is that as the Earth's spin slows slightly, the equator shrinks. However, tectonic plates don't shrink as easily, meaning the edges of the plates get squeezed. Although this amount of squeezing isn't huge, it does put added stress on plate boundaries that are already under stress, where earthquakes are more likely. More powerful earthquakes could rock the globe in 2018 because of infinitesimal changes in the speed of the Earth’s rotation. A minuscule slowing of the Earth’s rotation over years, which can extend the length of a day by a millisecond or more, appears to be linked to an increase in major quakes. Historical data since 1900 clearly reveal a “strong” link between major global earthquake activity and a slight slowing of the Earth’s rotation for five or six years. The Earth’s rotation is known to go through regular decades-long periods in which it slows down and speeds up. Even seasonal changes, like a strong El Niño, can affect the planet’s rotation. Residents in Alabama were left baffled last week when a loud boom resounded across much of the state. This year alone, similar noises have been reported 64 times this year, in locations including Michigan, Lapland, St Ives, Swansea and Yorkshire. The theory goes that the slowdown creates a shift in the shape of the Earth's solid iron and nickel "inner core" which, in turn, impacts the liquid outer core on which the tectonic plates that form the Earth's crust rest. Their study looked at all earthquakes registering 7 and up on the Richter scale since the turn of the 20th century. In this timeframe, the researchers discovered five periods of significantly greater seismic activity occurring approximately every 32 years. The last slowdown began four years ago. Once again we have current Earth changes such as plate movements and earthquakes ascribed to “anything but Nibiru”, as Nancy likes to say. Now the increase in earthquakes is supposed to be caused by a slight global slowdown, based on statistics from the past. How nebulous is this? Researchers can ascribe earthquakes happening anywhere in the world, in any Richter scale, with any frequency over a period of 4-5 years and decide this is due to a miniscule slowdown of a millisecond in rotation. Never mind that the numbers don’t line up. Leap seconds have been regularly added to the world’s clock, less frequently in recent years, yet now we are to believe that 2018 will be a year of increased earthquakes due to such a slight slowdown. This is known in science as searching for facts to line up with a theory, and discarding any facts or logic that does not fit the theory. Meanwhile, odd booms are heard from snapping rock in the stressed North American Plate and where the UK is being pulled down into the Atlantic – all this caused by the 7 of 10 plate movements driven by Nibiru’s approach. Only the admission that Nibiru is indeed here and steadily approaching will connect the dots, but the media and the terrified establishment in control of the media will always have some excuse for the Earth changes. To date we have had the earthquake increase due to fracking or more sensitive seismographs, the Earth wobble due to the Arctic being more ice free than the Antarctic so the globe spins like a top out of balance, red dust in the skies due to NASA sending up such dust clouds into the ionosphere to measure the jet stream, and anything not covered by those lies due to claims about the Sun or Global Warming. Anything but Nibiru. It all began already at the end of September. According to the IAEA, in late September and early October, ruthenium-106 was detected in the atmosphere in several European countries. German and French scientists believe that with a high probability of a source of release is in the South Urals. But Greenpeace made a request to Roshydromet and it turned out that this is not so. BULLETIN on the radiation situation in Russia in September 2017. "In the case of the receipt of high (EO) and extremely high level of pollution (EEZ) of the environment, the relevant information is published on the site of Roshydromet (http://www.meteorf.ru/) Operative information>>"
Later it turned out that ruthenium was found in the atmosphere of Russia. Although its concentration is safe. Many accuse Romania because the pollution level was higher than in Russia (at least this was stated by Rosatom). As only one element was detected, this eliminates the possibility of an 'nucler accident'. A more suitable term is a 'leak'. Ruthenium-106 (Ru-106) is absent under normal conditions in the environment, even its small concentrations indicate an accidental release. So the cause is unknown. Rosatom declares that there were no accidents on its nuclear facilities and is pointing a finger at Europe. The Kremlin was requested by all departments and did not know about any causes and emergency situations that could lead to the release of ruthenium-106, said Dmitry Peskov, spokesman for the Russian president. Rosatom holds second place in the world in terms of uranium deposits ownership, fourth in terms of nuclear energy production, produces 40% of the world’s enriched uranium and 17% of the world’s nuclear fuel. Rosatom is the only vendor in the world able to offer the nuclear industry’s entire range of products and services, starting from specialized materials and equipment and all the way through to finished products such as nuclear power plants or nuclear powered icebreakers. A real detective story happened in Russia. Could the Zetas clarify the situation? A real detective story happened in Russia. Could the Zetas clarify the situation? Very similar to the situation in February. Ruthenium 106, which does not occur naturally and has a half-life of about a year, is used for medical purposes. During the Cold War, Mayak was part of a string of closed military areas whose existence and function were supposed to be kept secret. The accident in 1957, which released radioactive waste, was kept under wraps for decades. The conflicting statements from Rosgidromet on November 21 came weeks after reports of a radioactive cloud drifting westward from Russia first appeared in Europe, a delay that government critics said was reminiscent of the Soviet government's initial silence about the Chernobyl nuclear-power-plant disaster in 1986. The Russian Meteorological Service finally confirmed that it had recorded the release of "extremely high contamination" of the radioactive isotope Ruthenium-106 in the southern Urals region in late September. That was after radiation monitoring programs in Europe had earlier detected low levels of the isotope in air as far away as Germany and France. Russian's state weather service Roshydromet reported recently that levels of ruthenium-106 from the Agrayash weather station in the southern Ural mountains was 986 times those of the previous month. Ruthenium-106 is produced from the fission or splitting of uranium-235, the type of uranium used in nuclear fission reactors, so it's found in spent nuclear fuel. It's also used in medicine for cancer radiation therapy, especially for eye and skin tumours, so it may be produced for that purpose. And it's used in radioisotope thermoelectric generators that power satellites. Nuclear scientists say that if the radiation had come from a bomb, or an incident at a nuclear reactor, they would expect unusually high levels of a range of different radio-isotopes. However, since only a peak in Ru-106 was spotted, this points to a fuel reprocessing plant or medical facility as the most likely source. The highest concentration of Ru-106 was registered in Argayash, a village in the Chelyabinsk region in the southern Urals. 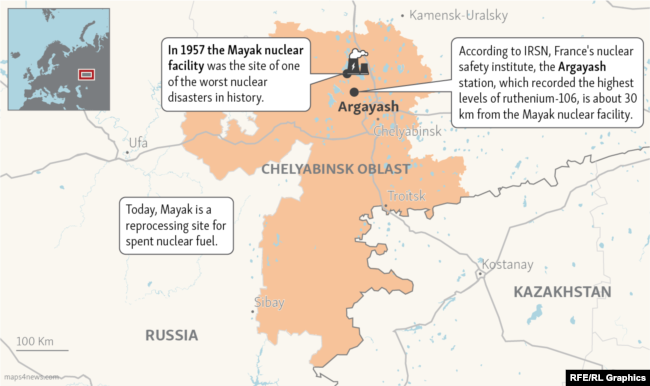 This is close to the Mayak nuclear facility, a reprocessing site for spent nuclear fuel. Naturally occurring ruthenium (44Ru) is composed of seven stable isotopes. Additionally, 27 radioactive isotopes have been discovered. Of these radioisotopes, the most stable are 106Ru, with a half-life of 373.59 days. release that flooded Europe in February, 2017 was never admitted by any facility, there is reluctance by Russia to admit fault during the harmless release of Ruthenium 106. The European leak was from active power plants, which affect profits of the elite if forced to shut down, where the Russian leak is from waste facilities which are a taxpayer drain, not a profit making enterprise. Thus, fault is being admitted. and resulting brilliant explosion in the Urals astonished commuters in the dark early morning hours. Nuclear facilities, in all stages, are built primarily of concrete, and regardless of how reinforced this will crack and allow leaks. More disasters await, primarily in Europe and in the US. Iodine-131 could emerge from a site of active fission, such as would be ongoing at a nuclear power plant, and given the amount of stretch stress in the Eurasian Plate this is the likely source. Iodine-131 would not be coming from the Chernobyl or Fukushima dead plants, as they no longer support active fission. These new emissions are from active power plants, which the owners are loathe to report as there would be public pressure to shut them down. Then profits and jobs stop. Nuclear power plants require constant cooling from water flow, and where radiation contamination is supposedly contained, slight breaks in the barriers can allow water to penetrate and radiation to thus escape. The plant must be shut down to check for these slight cracks in the containment walls, and once again there go the profits and jobs. The new Eurasian Plate seaway is anticipated to run just to the east of the Iran border, going up through western Pakistan and Afghanistan and thence round along the eastern borders of Turkmenistan and Uzbekistan where the lowlands are skirting the foothills of the Himalayas. It cannot run up through Karachi as Pakistan runs into the Himalayas and there are rock bonds that will not pull apart. Yet rip it must as the Eurasian Plate has lost any friction preventing movement where the African Plate formerly snugged up against it through the Mediterranean and down through the Red Sea. The Atlantic Rift has pulled apart, pulling the great Eurasian Plate to the west. To the east, where the Himalayas are glued to the Indo-Australian Plate and the Pacific Plate, there is glue and resistance to move. Thus, moving in the direction of least resistance, the Eurasian Plate rips through the lowlands skirting along the highlands, a stretch zone adjustment that is silent and only deadly to those directly above the point of tear. This has happened before to the great Eurasian Plate, as the lowlands through his middle attest. The Moon Swirls that form the String of Pearls are now becoming visible Naked Eye! Note there are 12 pearls in the necklace above the break in the cloud at sunrise, and there are 12 beams of light coming down like arrows from where the sunlight shines through the break in the cloud. Not a coincidence! The String of Pearls moon swirl arrangement has been noted in most of Alberto's recent photos, very near Nibiru itself. The String of Pearls (Moon Swirls) in a Norway sunrise photo on October 5, 2017. There are three objects on the left of the Sun, which is rising on the right. Deer Hunter caught bright spheres above and beams of light below cloud over the Missouri River, US. The sun had set approximately 15 minutes earlier, when they noticed a strange group of lights above the clouds and beams of light reflecting off the river. Although the event only lasted seconds and was gone, his friend managed to take a picture of the phenomenon. The String of Pearls made an appearance in the early days of Nibiru’s descent into the inner solar system, in 2003-2004, as it was either on the opposite side of the Sun or at a distance from the body of Nibiru itself and the Moon Swirls were able to reflect sunlight back toward Earth. Then the String of Pearls showed up in 2010 on the SOHO and Stereo Ahead and Behind satellite images, because Nibiru had come closer to the Sun during its passage and was able to reflect more brilliant sunlight toward the cameras, and NASA was not on guard and thus not erasing this from their images. But between 2004 and 2014, the String of Pearls was not visible from Earth. Then the string made a brilliant re-appearance in Alberto’s photos in 2014 and have been appearing regularly since in his filtered photos. But the naked eye sightings of the String of Pearls - seen and captured on film in Norway at sunrise on October 5, 2017 and now in Missouri on November 20, 2017 at sunset - show the beginning of a new phase for Nibiru denial. Nibiru itself is so heavily shrouded by charged red dust that unless the dust cloud reflects light, creating a brilliant Second Sun sighting, it can be denied. The String of Pearls is not so restricted, and will destroy the cover-up. Hi Nancy and Zetas. I live in Morelia, Michoacán, in México. Yesterday I recorded what it seems to be an alien spaceship. My city is small, one million habitants on average. We are not used to this kind of phenomenom in this city, it was very visible and lasted in the skies about one hour and a half. Could zetas coment if there is a message here? I've been thinking about a possible subconscious warning for us about the volcanic or seismic activity. Will this kind of sightings be on increase in this area?, Any recomendations?